Lock in a great price for Holiday Inn Express Sant Cugat – rated 8.1 by recent guests! The location was close to my work place. Billing was quick and did not take too much time. The staff were friendly. They made sure that the taxi was ready and waiting for me to head to the airport before time. So that was a nice thing. Fast check-in and checkout. Room spaces. Bathroom spaces and design. The staff were really friendly and helpful, the view from the room was nice. Convenient location for business purposes, 5 min walking from the San Juan train station in San Cugat. It's pretty clean, and has a bar (friendly with local police :)) Not sure if the best value for money, judge yourself - 134 euro for double room with breakfast for 2. Helpful and polite personnel at reception desk. Cleanliness of room adequate. Value for money, parking free, breakfast, location not nice but useful to reach the city. Room was clean, modern and perfect for a night's stay. A kettle and tea/coffee are provided (great!) but no milk (disappointing for a British traveller). Location is really convenient and parking is included which was great. Handy stopover near motorway, large clean comfortable room, quiet, good variety at breakfast, evening Resturant basic, but adequate. Holiday Inn Express Sant Cugat This rating is a reflection of how the property compares to the industry standard when it comes to price, facilities and services available. It's based on a self-evaluation by the property. Use this rating to help choose your stay! Set outside the A7 Business Park and a 30-minute train journey from Barcelona, the Holiday Inn Express Sant Cugat offers free parking. This stylish hotel has rooms with flat-screen TVs. The Holiday Inn’s air-conditioned rooms are comfortable and brightly decorated. Each has tea and coffee making facilities and satellite TV channels. Free WiFi is available. A buffet breakfast is served daily and there is also a snack bar on site. The center of Sant Cugat is 0.6 mi away and has a small selection of restaurants. The hotel offers laundry, dry cleaning and ironing services. There is also currency exchange and luggage storage available at the 24-hour reception. Sant Joan Railway Station is just 650 feet from the Sant Cugat and the AP 7 Motorway is a 5-minute drive away. This property is also rated for the best value in Sant Cugat del Vallès! Guests are getting more for their money when compared to other properties in this city. 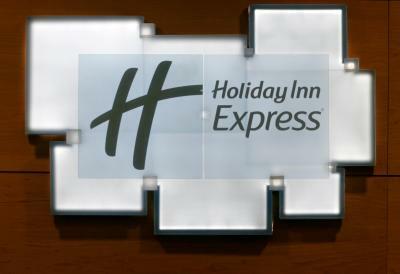 When would you like to stay at Holiday Inn Express Sant Cugat? This comfortable room features warm red and orange tones and 1 double bed. A flat-screen TV with satellite channels and pay-movies and tea and coffee making facilities are included. Free WiFi is available. Maximum capacity for this room is 2 adults and 2 children (please see Hotel Policies). This comfortable room features warm red and orange tones and 2 single beds. A flat-screen TV with satellite channels and pay-movies and tea and coffee making facilities are included. Free WiFi is available. This comfortable room features warm red and orange tones and 1 double bed and 1 sofa bed. A flat-screen TV with satellite channels and pay-movies and tea and coffee making facilities are included. Free WiFi is available. House Rules Holiday Inn Express Sant Cugat takes special requests – add in the next step! Holiday Inn Express Sant Cugat accepts these cards and reserves the right to temporarily hold an amount prior to arrival. This was the most difficult place to find despite seeing it from AP7. Have travelled this route for twenty years and never taken so long to reach a destination. Zip code given covers very large area. Sat Nav left us miles away. Really needs much clearer information regarding location, exit number and route to take from AP7. Staff wasn’tFriendly.My little son bed wasn’t comfortable and without duvet cover.Breakfast was very poor very little amount of food and no choices very Dirty and messy Tables with no space to sit.I never recommend this Hotel to my friends! We booked a family bedroom but the children's bed was really not comfortable to sleep!!! Bed and room were great! Rooms were clean and bed was comfortable. Wifi - almost never working in the room. TV was not working at all for three days. Good location if you visiting HP. Good price. The breakfast was a bit disappointing in that there was only one member of staff working in the whole restaurant on a Sunday morning and therefore the empty buffet was not being replenished until we asked a few times and tables were not being cleared etc. but apart from that we can't fault the hotel.